I’m led through the noisy main hall, out the back where the braver ones are having a kick-about, and down the ramp to the garage. Inside all is quiet and calm. 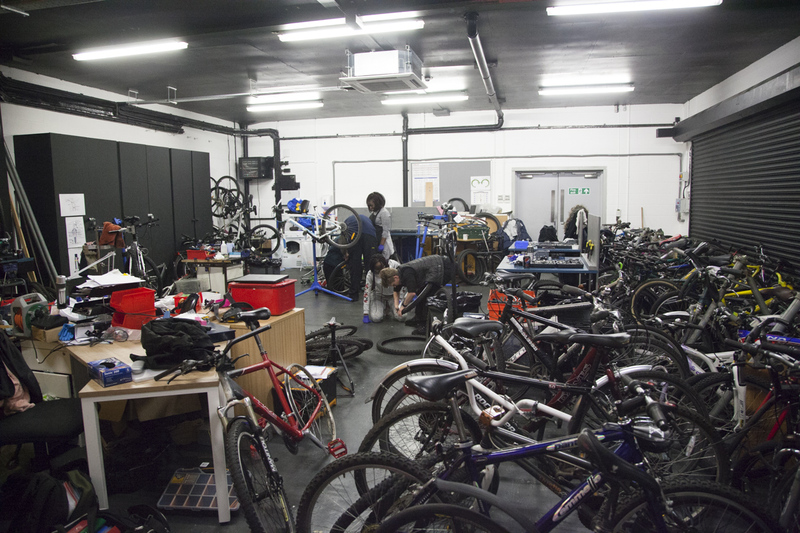 I’ve been looking forward to visiting the bike maintenance project at The Factory Youth Zone in Harpurhey for some time. It sounds like such a good idea. 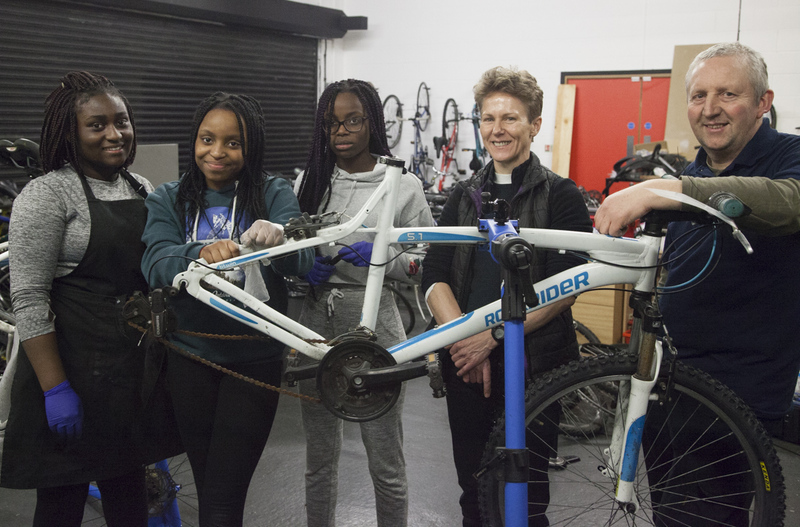 In amongst the dozens of bicycles, all in different states of disrepair, three young women are working together with youth worker Heather and volunteer Mike on a couple of mountain bikes perched on maintenance stands. With donations of professional tools to get things going Heather explains they now have four fully-equipped workstations where young people work under supervision. 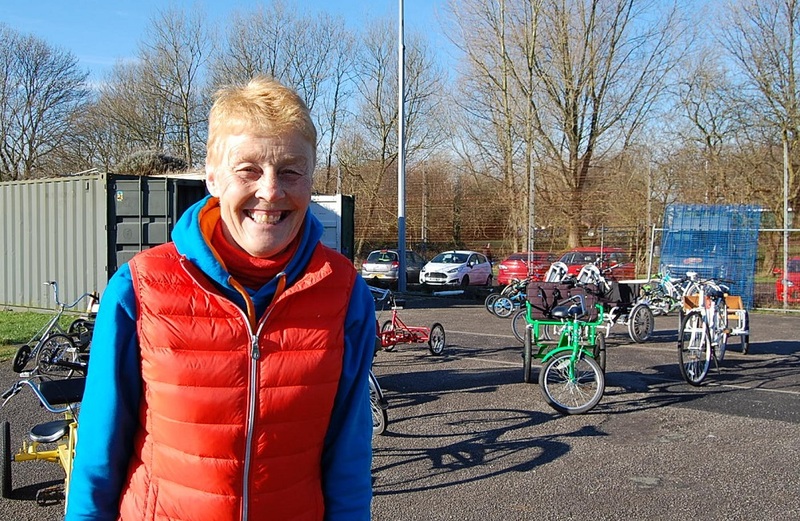 “Most of the bikes here have been donated by the police,” Heather says. 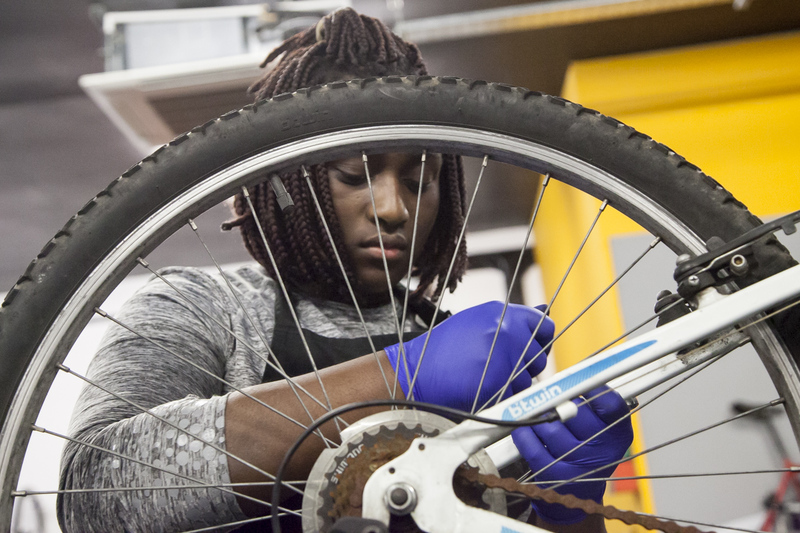 “The young people sign up for a twelve week programme where they choose a bike and learn how to put it together with new components. As long as they try hard and respect the place, they get to keep the bike at the end of it. “But it’s more than just bike maintenance skills isn’t it?” I ask. “This is a very able group,” says Heather, “but for others it’s about building self-confidence, communications skills and manual dexterity. Some young people think they can’t do it but once we spend time with them and they see we trust them with the tools then we get results. Success, Suzanne and Victoria tell me they are all friends from Moston. Success has been working in the garage for three months and has already earned her bike. The others are just starting out. “So you’re the expert?” I suggest. “So you look forward to your Monday evenings?” I ask. At the next workstation volunteer Mark is helping Victoria with her rear tyre. “I’ve been fixing bikes at my Collyhurst house for years,” he says, “and lads would always come round. It’s a good way for kids to gain confidence. Once tyres and inner tubes are on and pumped up, the young women move on to the their gears. It’s starting to look complicated so I leave them to it. After weeks of dull, grey, overcast, cold, wet and wintry mornings that reaffirm the belief I’m designed to hibernate, I woke up today to a wholly different world. Bright and sunny with a clear blue sky. Just the weather for a bike ride so I’m here at Boggart Hole Clough in my shorts. IN MY SHORTS! Are you bonkers? It’s February and freeeeezing. I’m really here to meet Sue Blaylock from Simply Cycling. She’s ready with a big smile and a hot cup of tea. Before long we’re stood in the sunshine and can just feel a little of its warmth. It’s very civilised. There’s a running track in front of us with grass verges and picnic tables. 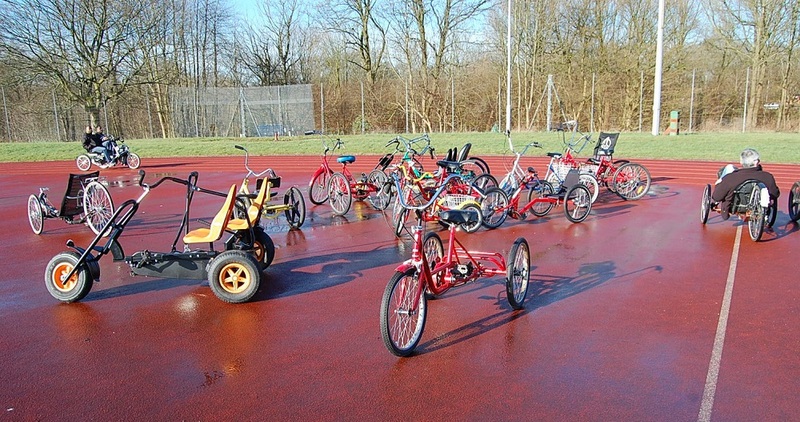 We are surrounded by a selection of bicycles, trikes, wheelchair accessible bikes and tandems. Most have foot pedals, others are hand operated, several have side by side seats and some have covers. I didn’t know such a variety of cycles existed. 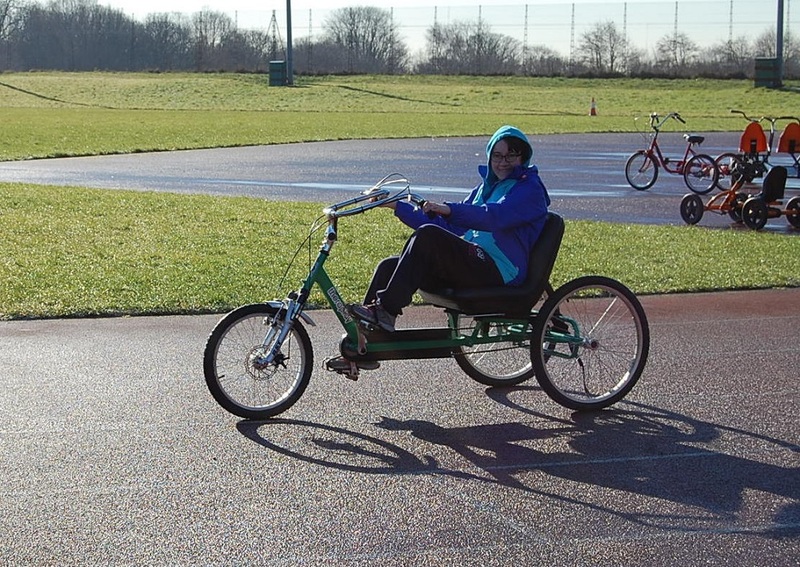 Sue explains they cater for all abilities and aim to have something to suit everyone. “It’s £2 a session” she says, “so it’s affordable too”. Although it’s cold she’s already had some customers. Another couple arrive soon after I do. 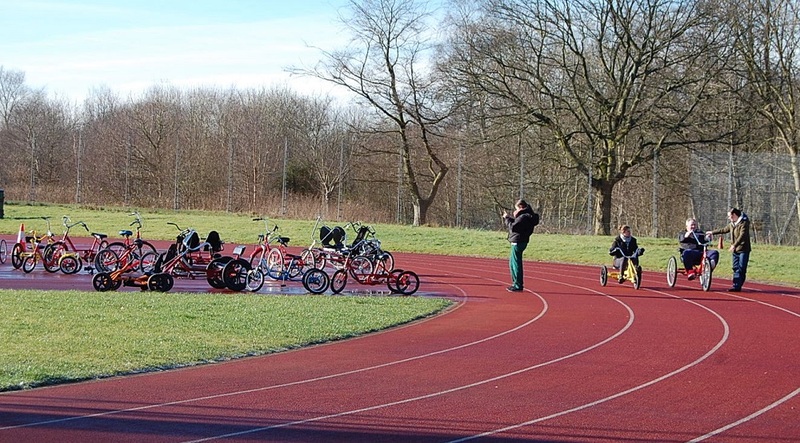 They are regulars and once the social niceties are done Sue helps them find the right bikes and they’re off around the track. More people arrive, including Sean and his carer. They know Sue well and she gets a big hug from Sean before finding him his favourite cycle. 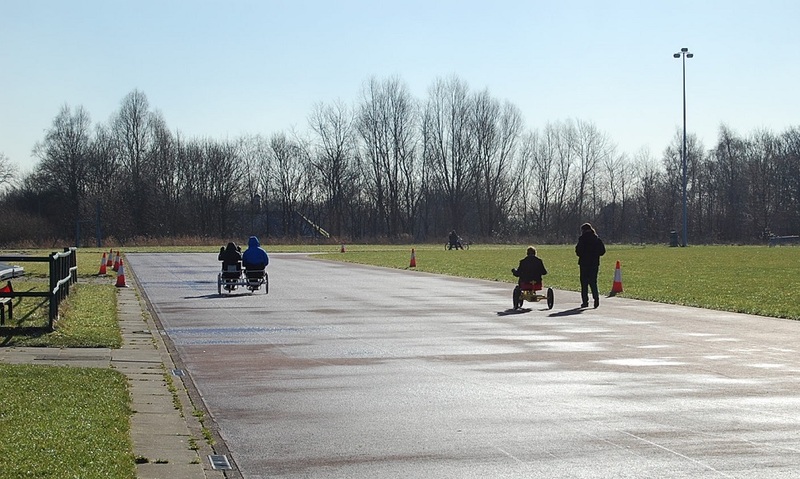 It’s hand propelled and the two sit side by side as they set off on the track. I ask Sue how long Simply Cycling has been operating for. “We started in Wythenshawe Park about 14 years ago. 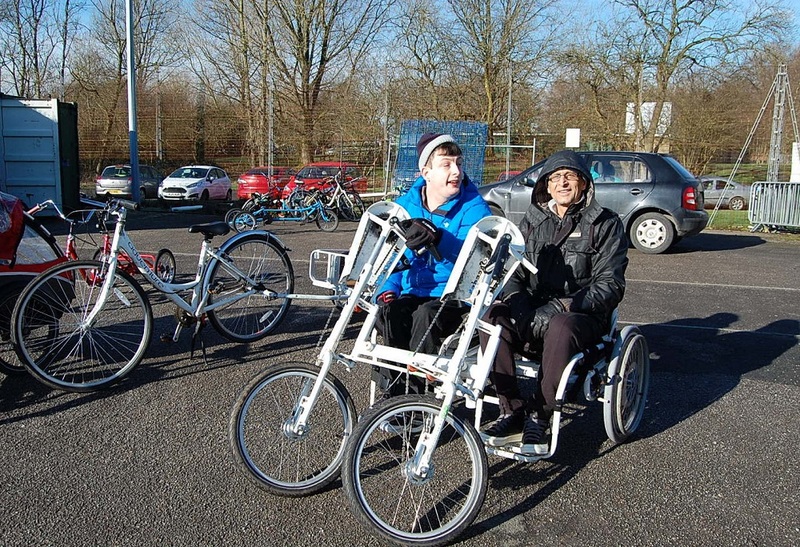 The main focus was to make cycling accessible to everyone especially people with disabilities but we are entirely inclusive. We welcome any age and any ability. Laura, who arrived earlier, waves to us both as she glides past. We discuss the fee. £2 isn’t much and it goes towards the using the track facilities at the park, purchasing cycles and other running costs. Sue, along with others run the sessions and maintain the cycles so that they’re in tip-top condition. There are some paid staff, some sessional workers and some volunteers who all work hard together to ‘make things work’. New volunteers are always welcome. As I leave I thank Sue for her time and for just being there on such a cold day.